Bob Fink, a resident of Village East Towers, a high rise in New York’s Lower East Side, says he can’t wait for the creation of a community microgrid in his neighborhood that would stave off the “shop of horrors” associated with Superstorm Sandy. Indeed, Superstorm Sandy prompted Garrin, founder of the Beyond the Grid microgrid project, to assemble a team of experts and community members to create a community microgrid. The team won $100,000 in the first round of funding in the New York Prize competition, a $40 million competition to help microgrid development in the state. 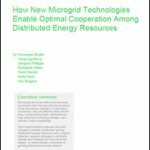 The Beyond the Grid consortium is proposing a $15.4 million community microgrid—run in many ways like a rural electric co-operative—that would provide 100 percent of the power to about 4,000 residents in about 11 buildings, including four schools. A community organization would sell power to the residents and businesses from the microgrid, which would include 8 MWh of battery storage and 2.5 MW of generating capacity made up of solar and combined heat and power. The project would be able to island from the local utility Consolidated Edison and also provide power to the utility. 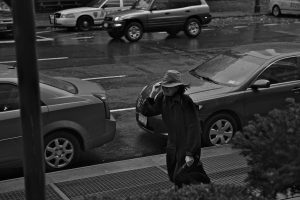 Garrin, an artist who lives a few blocks from the microgrid site, suffered through the blackouts caused by Superstorm Sandy, and was impressed by how the community worked together to help people after the storm. He offered to pull together engineers, lawyers, designers and others to propose the microgrid project. The partners include the law firm Morrison & Foerster LLP, Lockheed Martin Energy, Two Bridges Neighborhood Council, Nazareth Housing, Louis Berger Group, Stout Risius, Ross, Inc., WiFi-NY, and others. Just imagine: a working elevator, some lights and easy access to water during the next disaster — which I hope never comes. The hope is to create a demonstration project that can be replicated in other parts of the Lower East Side, the rest of New York and across the country. “Lockheed Martin Energy joined the Two Bridges Community microgrid project because the community microgrid truly meets the spirit of the New York Prize microgrid objectives – which is to foster public private partnerships that will help develop innovations in technology, workforce redevelopment, business and financial assistance to improve the resiliency and sustainability of the communities these microgrids serve,” said Roger Flanagan, managing director, Lockheed Martin Energy. As he worked to create a meaningful response to Hurricane Sandy’s devastation, Garrin wasn’t crazy about the state’s and federal government’s strategy, which focused on planning evacuations and relying on backup power. “I didn’t think it met the needs of the community and didn’t address climate change. The community might have no power and people wanted to stay where they were,” he said. A community microgrid, he figured, would solve both those problems. In addition, Garrin liked the idea of creating an organization that resembled a rural electric cooperative to generate and distribute the energy from the microgrid. Garrin and his associates envision a microgrid that’s a qualifying facility under the Public Utility Regulatory Policies Act (PURPA). “It will operate as a small power producing facility under PURPA. This way we can create our own closed loop system and disconnect from the grid,” Garrin said. In addition, the Beyond the Grid organization can own the meters. The smart grid is designed to seamlessly island from the Con Edison grid in the event of a fault. The project is in partnership with Con Edison, working closely with the utility engineers, and as a natural gas customer of Con Edison, Garrin said. 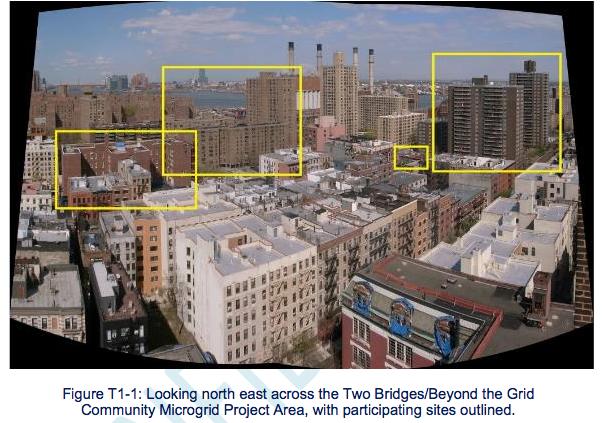 The community microgrid, which would be located close to Con Edison’s East River (14th st) station that blew up during Superstorm Sandy and blacked out the area, would be connected to the utility at a number of points in a bi-directional way. “We are not doing net metering when we feed power to the grid. This is a commercial connection to Con Ed,” Garrin said. The organization would sell power under Con Edison’s service class 11, he said. “If you have surplus power and can provide it, that’s how you connect to Con Ed,” he said. “We will own our meters and sell power to ratepayers and participate in the regionalized carbon trading,” Garrin added. Garrin and his partners are applying for a second stage of funding under the New York Prize. But he believes the project can be financed with or without that money. The project is designed to be scalable and replicable, Garrin said. If replicated, it could be very useful during an East Coast blackout. “The operating model is a non-profit community organization serving a public benefit. If there are a lot of these block to block, they can all feed in and there can be whole sections that could be resilient to outside problems,” he said. 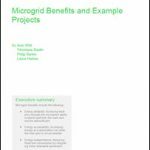 Editors note: Proposals are due October 12 for NY Prize second stage funding, which is being offered for microgrid engineering, design finance and business plans.